Today's IP surveillance systems depend on reliable, quality network switches to connect cameras and VMS servers. Which one should you choose given the vast number of switches available in the market? As part of our Winter 2012 Integrator Survey, we asked 100 integrators what was their favorite network switch for use in surveillance. Interestingly, a strong consensus existed with over 70% choosing between 3 manufacturers. More integrators chose Cisco, at 31%, than any other. Netgear followed, at 20%, with HP barely behind, at 19%. An additional nineteen manufacturers were represented, though none gathered more than a few percent of the vote. With 70% of respondents selecting the top three manufacturers, these results are far less fragmented than all of our other survey questions. This shows there is much greater consensus in the industry that these products are likely the "safe" choices. "Cisco is the key of the mountain, and these days you are dealing with the IT departments more than you are with the old security managers of the past, most of the time the IT departments will have a say in what you can and cannot use in their MDF's or IDF's"
"Hate to be a sheep, but nobody gets fired for using/recommending Cisco." "My personal preference leans to Cisco Systems, although we have had great success with HP ProCurve, Nortel/Avaya, NetGear and a few others as well. Having such a large market share means there are many people already trained in the Cisco ways. Besides that, they just work." "Cisco. Everyone knows Cisco and their equipment is rock solid. Most of the bids we respond to, Cisco is almost always a valid choice for network equipment." "Right now, Cisco - their Small Business line of PoE-capable switches has been serving us very well - very stable and quite cost-effective (not the LEAST expensive, but still in a good price range for the performance)." "Cisco. We trust Cisco as it has never failed of the shelf like others we have used." "Cisco, because they have big range of switches for any kind of system"
Note that Cisco results also include a few votes for Linksys. We merged these two because the models cited as Linksys have been moved to Cisco's small business line. The most mentioned model in the Cisco line was the 300 Series of managed network switches, one of Cisco's more recent product releases in the small business line. "Netgear. Highly available, reasonably priced, reliable." "Netgear. Low cost, reliable, great lifetime warranty (on their business class equipment). The GS724TP model is the backbone of many of our networks. Their "Smart Switch" line provides a web interface allowing us access to switch configuration, ability to remotely reboot cameras, set up VLANS ect." "Netgear - They have a lifetime warranty on their Pro series and the costs are not as high as say a Cisco switch." "Netgear, because they are affordable and reliable"
"I have had very good luck with the L2 24 & 48 port switches from Netgear. (GS series) Good value for performance." The Netgear Smart Switch series was mentioned multiple times, both in comments above, and by others. "HP Procurve. All the features of Cisco at fractional costs." "Tend to prefer the HP ProCurve. Love the switch and its reliability. Costs a little more, but performs very well." "HP - good range, good performance, cost effective"
"HP because they allways work in all our installations and we have certified employees for work with them"
"For everyday clients we use HP. HP makes a very good product at a fraction of the cost of Cisco." "Cisco or HP Procurve - We mostly use Cisco but it can be very expensive and allot of the time is much more difficult to configure than it should be. I like Procurve as its 30-50% cheaper then Cisco and for video works just as well. Implementing large scale multicast routing on a Cisco network is painful"
No integrators mentioned specific models of HP switch as their favorite. However, following through from other manufacturers, we suspect that the small business 1900 Series of web-managed switches would be popular. If we look at responses filtered by those installing eight cameras or less, on average, results change somewhat. 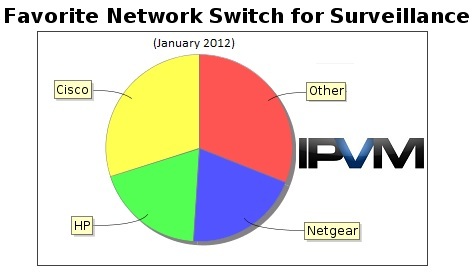 Netgear is the most preferred switch among these respondents, at 29%, with Cisco second at about 26%. HP's popularity dips dramatically, with only 8% of the vote, barely more than Trendnet and D-Link, both at 7%, two manufacturers who received very few votes overall.